Named after Pope Gregory XIII, the Gregorian calendar was introduced in 1582 – six years after the death of Luigi Lillio, Italian doctor, astronomer and philosopher credited with conceptualizing replacement of the Julian calendar. Julian, a hail to Julius Caesar, dominated the known world from 45 BC until the Gregorian revolution in 1582. On average, Earth takes 365 days, 5 hours, 48 minutes and 45 seconds to complete one orbit around the Sun. Julian and Gregorian years are 365 days divided by 12 months. What to do with leftover hours, minutes and seconds – both embraced the leap year solution, vastly different implementation exposed Julian’s greatest flaw. Julian added an extra day to February every 4 years, a system resulting in a mathematical gain of one day every 128 years. That’s 3 days every 400 years, 28 days by the time Gregorian reform took hold in 1582 – close to a full month out of sync with astronomical observances of solstice and equinox. Gregorian leap year resulted in an astounding improvement of 1 day gained every 3,226 years. Following 10 days dropped from October 1582, leap year occurs when a year is evenly divisible by 4, never when evenly divided by 100 unless that year happens to be evenly divisible by 400. Despite advantages, transition from Julian to the Gregorian civil calendar took centuries. Russia ( in 1918 ) and Greece ( 1923 ) were two of the last countries to formally acknowledge Gregorian passage of time. Pockets of Orthodox church goers aside – Gregorian became the global standard in 1930. The Gregorian calendar put an end to Julian’s sloppy housekeeping, instead of sweeping time under the rug, we had a place to store it properly. Perfectly acceptable until Richard Henry and Steve Hanke asked us to consider Gregorian’s unpredictable meandering. A calendar of irregular months favoring financial institutions – rent, lease and loan payments due regardless of 28, 30 or 31 day spreads. Holidays floating about from year to year, the first day of school swinging by a week, dependent on the first Monday after Labour Day. Ponder a calendar where Christmas always falls on a Monday. Year after year, same dates falling on the same day. Suspend familiarity and consider a world without time zones – genesis of the Hanke-Henry Permanent Calendar. Our plan offers a stable calendar that is absolutely identical from year to year and which allows the permanent, rational planning of annual activities, from school to work holidays. Think about how much time and effort are expended each year in redesigning the calendar of every single organization in the world and it becomes obvious that our calendar would make life much simpler and would have noteworthy benefits. Our calendar would simplify financial calculations and eliminate what we call the ‘rip off’ factor. To determine how much interest accrues on mortgages, bonds, forward rate agreements, swaps and others, day counts are required. Our current calendar is full of anomalies that have led to the establishment of a wide range of conventions that attempt to simplify interest calculations. Our proposed permanent calendar has a predictable 91-day quarterly pattern of two months of 30 days and a third month of 31 days, which does away with the need for artificial day count conventions. * The same day always falls on the same date, year after year. * It maintains a 7-day week to preserve a day of religious observance (like Sabbath). * All months would have 30 days, except March, June, September, and December that are 31 days in duration. 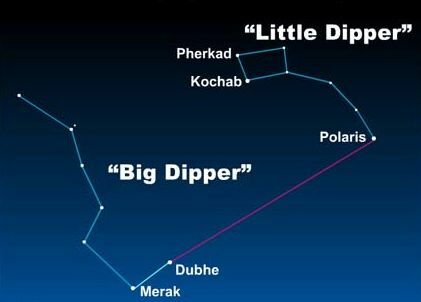 * Every 5 to 6 years, an extra week, a “mini month,” is added to the end of December to bring the calendar in sync with seasonal changes on Earth. In a February 12, 2016 interview with the Washington Post, Henry and Hanke discussed why they would like to abolish time zones in favor of using UTC time everywhere in the world. The Post asked them why they were strongly advocating one universal time zone. Wouldn’t it be better to regulate time zones with local solar time? Because from a physics point of view, there IS only one time! And this principle of physics lines up perfectly with the principles of economics…. Local solar time was fine, when almost all activity was local! Today, much activity is global, and ONE time is called for. You’d quickly get used to the new reading on your watch and your clock. I (Henry) recall when my elderly mother in Canada said to me, oh, it was hot today, 30 degrees! If she could change [from measuring temperature in Fahrenheit to measuring it in Celsius], everyone can change! 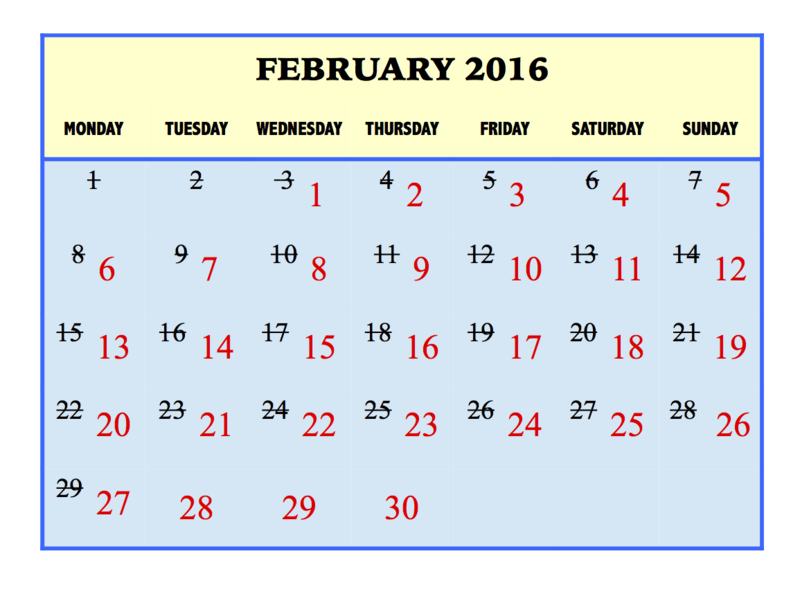 February 2016 calendar with Gregorian days crossed off. Numbers in red show dates in the Hanke-Henry Permanent Calendar.